There are four different versions of Biologique Recherche’s Lotions P50 available in the UK; the Lotion P50, the Lotion P50V, the Lotion P50W and the Lotion P50 PIGM400. Each one provides the same core benefits, but their formulations change slightly to suit each and every Skin Instant®. The Lotion P50V is the version of our Lotions P50 that was specifically formulated with added vitamins and walnut extracts, which protect from the ageing process and nourish the epidermis. The antioxidant ingredients of this lotion make it suitable for more mature and/or devitalised Skins Instants®. The Lotions P50 are Biologique Recherche’s unique acid toners; the fruit of 30 years of reflection and experience. These balancing and exfoliating lotions speed up the epidermis’ natural exfoliating process and the reconstruction of the epidermal shield. The fortified epidermis can then fulfil its protective functions completely, enhancing the skin’s self-regeneration potential. 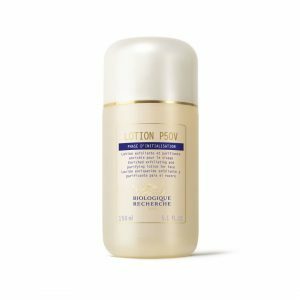 The Lotion P50 ritual is a key stage in all Biologique Recherche skin care programmes; it not only exfoliates, but it also purifies, regenerates and maintains the pH of the epidermis. The chemical exfoliation of the skin is a procedure that happens thanks to the topical application of a cocktail of hydroxy acids. All Lotions P50 contain a potent combination of AHA, BHA and PHA exfoliants: lactic acid, malic acid, citric acid, salicylic acid and gluconolactone, to act as a chemical exfoliator. As its name indicates, the Lotions P50 gently renews the skin over 50 days – ‘P’ stands for peeling and ‘50’ stands for 50 days – which represents about two epidermal cycles, for a gentle yet effective exfoliating process. Devitalised and/or pigmented and/or less toned Skin Instants®. Exfoliating, moisturising and regulating agents: Poly, Alpha and Beta-Hydroxy-Acids, Cider Vinegar, Phytic Acid, Sulfur. Purifying and sebum-regulating agents: Magnesium Chloride, Vitamin B3, Horseradish, Burdock, Capsicum Extract. Smoothing and toning agents: Natural Sponge, Yeast and Walnut Extracts.